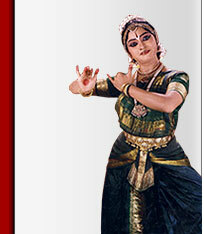 Geetha has authored a book – ‘BASICS OF BHARATANATYAM’ – printed by UTTARAA PUBLICATIONS in April 2004. The thought of bringing out a book occurred to Geetha, when she was compiling the notes for her students for these examcs. The information the students needed were not available concisely in a single book. That impelled Geetha the idea of providing all the required data in a form of a single book, which would be helpful for beginners in general and for all those students who may be appearing for these exams. The book deals with various topic like - description of terms used in Bharatanatyam, the various hand gestures, positions of feet, neck, etc. that are essential for a beginner. Other aspects like - the adavus, Rasa and Bhava, the repertoire of Bharatnatyam, Tala system have been covered in brief. This book is also useful for students appearing for the Akhil Bharatiya Gandharva Mahavidyalay (ABGMV) exams in Bharatanayam - Prarambik, Praveshika (I & II). Apart from these, an idea about the other classical dance forms of India and an introduction to some famous Gurus and institutions have also been given in this book.